A new twist on a traditional style portfolio. 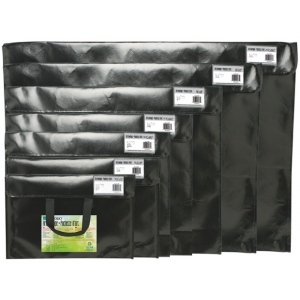 * Designed to withstand the elements better than paper-based envelopes these are made from an advanced coated non-woven weather-resistant polypropylene material. * Its textured interior is also delicate enough for carrying and storing artwork paintings and photographs. * Strong perimeter stitching and a durable handle allow for long term use while its lightweight construction makes it easy to carry. * Gloss black exterior with black comfortable nylon handles.